And if that weren’t enough, the website for debbiespenditnow.com is full of stereotypical Chinese imagery interlaced with statistics about how the red menace is eating our lunch thanks to the Democrats. It doesn’t upset me so much that the campaign could afford a Superbowl commercial, yet couldn’t be bothered to find an actual Chinese person to act in it – instead opting to use an American-accented woman offensively feigning Chinglish. What bothers me is that the old foreign menace political tactic is still being used as much as it was 50, 100, and 500 years ago… and it’s still working. This election season is already shaping up to be the most xenophobic ever (and given the 2010 election, that would be quite a feat). 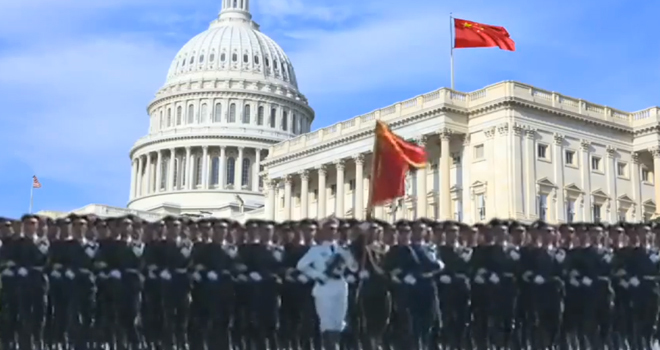 In a special election last summer Nevada congressman hopeful Mark Amodei ran an ad with the PLA marching on Washington and hoisting the Chinese flag atop the capitol building – suggesting a scenario that could not conceivably happen. Sure, plenty of people decried it; just as they are now for this new Hoekstra ad. But in the end, Amodei won in a 58-to-36% landslide. Throughout history, when a hopeful leader has nothing real to put on the table, caricaturizing and exaggerating a foreign rival to whip up nationalistic support has been a go-to short cut to power and influence. None of the great progress in technology and education has changed that. So we still see plenty of modern democratic leaders using the same playbook as some of history’s greatest monsters. For leaders that are supposedly so ideologically different, they can look pretty similar sometimes. “Holland, Mich. – Hoekstra for Senate today launched a new television ad and website that calls attention to Debbie ‘Spend-It-Now’ Stabenow’s dismal record on spending, the national debt and jobs, which has increased our reliance on foreign countries, including China. The ad and DebbieSpendItNow.com contrast Stabenow’s big-spending policies with Pete Hoekstra’s penny pinching agenda. Take away the racist overtones. The argument he is putting forth, in a very uncouth manner, is one that should be discussed on the campaign trail. The US must approach the Chinese the way the Chinese approach the US – with pragmatism in a zero-sum game. For example – why is the Peace Corps still in China? Why does the US still offer any form of financial aid to the Chinese? What should be the response towards China for its state sponsored theft of IP (withholding interest payments is the correct answer). No matter what people say, objective truth is objective truth, and the objective truth is: United States of America is crumbling into scrap. Face it my fellow Americans.